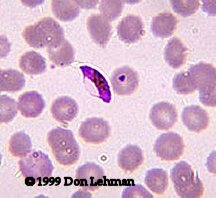 During Plasmodium falciparum infections, parasitemia can be high. 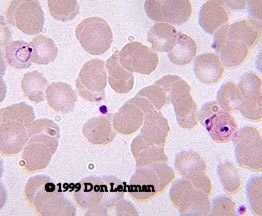 It is not uncommon to see more than one ring form in an RBC. Also, a single ring form will often have two chromatin dots. The gametes are 'banana' shaped and are diagnostic. Because infected RBCs become trapped in the capillaries, only ring forms and gametes will be seen in the peripheral blood. Another key characteristic is that infected RBCs are about the size of uninfected RBCs.